It’s very rare to see contemporary versions of Star Wars and Star Trek make similar creative choices. After all, part of what’s fueled the age-old Wars v. Trek debate are the series’ wildly different approaches to scifi. 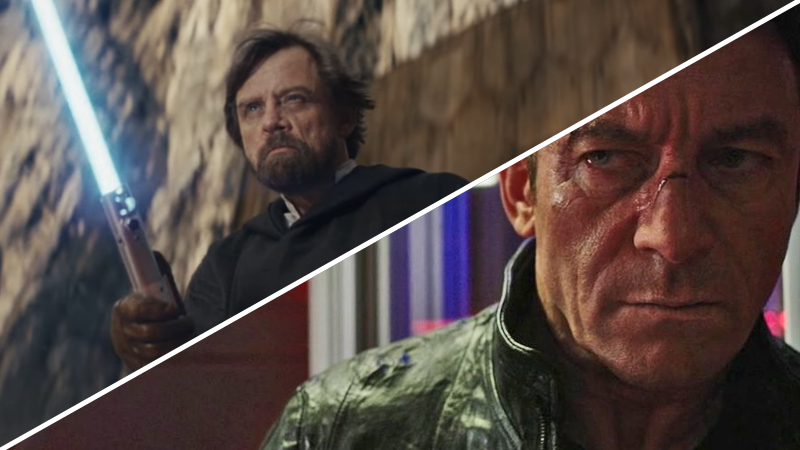 But with The Last Jedi in theaters and Discovery airing online, both franchises seem to be tackling something fascinating, questioning institutions in each world that fans have held dear for decades. Both The Last Jedi and Discovery have been met with a certain level of fan backlash. Mostly, this has been driven by a belief that these entries into their respective, venerable franchises have chosen to eschew what came before and do something “new”—something that, in the detractors’ eyes, goes against the ideals of the older material that defined each series. Additionally, a small but vocal contingent of both properties have turned to trollish seething over the fact that Discovery and Last Jedi feature prominent characters who aren’t straight white men, but that’s a whole separate, depressing thing. For Star Trek: Discovery, a lot of this backlash has centered around Jason Isaacs’ Gabriel Lorca, the distinguished but extremely rough-around-the-edges captain of the U.S.S. Discovery. Callous, abrasive, arrogant, and a warhawk, Lorca was presented as a morally grey and “gritty” captain that didn’t always manage to be a perfect representation of Starfleet’s scientific ideals—and, shockingly to some, didn’t always want to be. Fans worried that if a man like Gabriel Lorca could become not just part of Starfleet, but one of its most decorated officers, what did that say about Starfleet as an organization? Would Star Trek lose the soul of its idealistic utopia to cash in on modern drama’s penchant for dark realism? Questioning how the moral fiber of Starfleet holds up, especially in a time of war, isn’t exactly new ground for Star Trek—why, hello there, Deep Space Nine. But the idea of challenging fans’ long-held conceptions about the Federation is fascinatingly fertile ground for Star Trek to explore, even if concerned fans along the way worried what the show might have to say wasn’t in line with “their” Trek. The Last Jedi, meanwhile, encountered a similar response because of its portrayal of Luke Skywalker. Unlike the idealistic hero fans had anticipated Rey meeting when she finally handed over the Skywalker family lightsaber to him at the end of The Force Awakens, the Luke we encounter in The Last Jedi is a haunted, changed man. He wasn’t going to take on the First Order and save the day, he was weary, scarred, and bitter—not just at his personal failings in training a new generation of Jedi Knights, but at his discovery that the Jedi Order wasn’t the perfect, heroic institution he thought it was. Luke was ready not just to die, but to let the whole damn Jedi legacy, ancient texts and all, die with him, because he believed it wasn’t worth saving. Although by the end of the film Luke rejects some of his own cynicism and sees hope in a new generation of Jedi beyond him, for some fans the damage had been done. The Luke Skywalker they’d known and loved was dead, and the fabled dogma of the Light and Dark Side’s clear-cut morality that had defined Star Wars since it began—cemented in the unquestioning belief that the Jedi Order as an institution was a good, important thing—along with him. Rey and Kylo Ren were left to shape the future of the Force in their own way. But while both of these arcs leave the chance for refreshing new versions of Star Wars and Star Trek to follow in their wake, it looks like Star Trek: Discovery might have already backed down from this opportunity. This past week’s episode, “Vaulting Ambition,” revealed that the seemingly morally ambiguous Captain Lorca was actually from the evil alternate reality known in Star Trek as the Mirror Universe, suddenly (and disappointingly) rationalizing why he was so unlike the Starfleet Captains that had come before him. Truth is, he’s been secretly evil all along. It felt like Discovery had taken itself to an interesting if controversial edge, only to step back at the last minute and lean toward the comfort of fannish nostalgia. The theory that Lorca was a Mirror Universe plant had been floated by fans long before the eventual reveal—not just because the show started dropping some heavy hints that Lorca had a secret, but also because there were fans who couldn’t fathom someone like Lorca being a part of the idealistic Starfleet of their memories in the first place. The confirmation was effectively an assurance: Starfleet and its members are unquestionably good and noble, because the one person the show was using to question them was a villain all along. Suddenly something that felt very unsafe and new about Discovery became familiar; it was a “shocking twist” that somehow made things more boring. Discovery had ended the first half of it season in a interesting place for a Star Trek show, only to immediately dive into an arc that pandered to classic Trek tropes and ideas. Who knows, there’s still three episodes of Discovery to go. As the season barrels toward trying to tie off all of its current plot threads by its conclusion—not one, but two main characters revealed as being not who they seemed, the whole crew being stranded in an alternate reality, and oh yeah, a whole war with the Klingons still to deal with!— there could still be more interesting things the series has planned with Gabriel Lorca (especially if the character ends up returning to the “prime” reality of the show, now that everyone knows his secret). And just because The Last Jedi leaves the gate open for future Star Wars to blaze a bold new path, a similar outcome could easily occur. With J.J. Abrams returning as director, it’s both possible and plausible that Episode IX will choose to discard some of the controversial, “let the past die” elements of its predecessor to return to status quo of the galaxy far, far away. After all, Rey did swipe those ancient Jedi texts from Ahch-To before Luke could burn them all—she could use them to forge the familiar incarnation of the Jedi Order that Luke had failed to do. Regardless of what happens in either Trek or Wars’ future, it’s been fascinating to see their latest iterations at the very least ponder some radical questions about concepts and established orders their fanbases have held so dearly for years. Whether they will eventually pull away from doing so, or march ahead on questioning those preconceptions even further, remains to be seen, but it’s something that’s breathed some invigorating new life into both of these hallowed series.